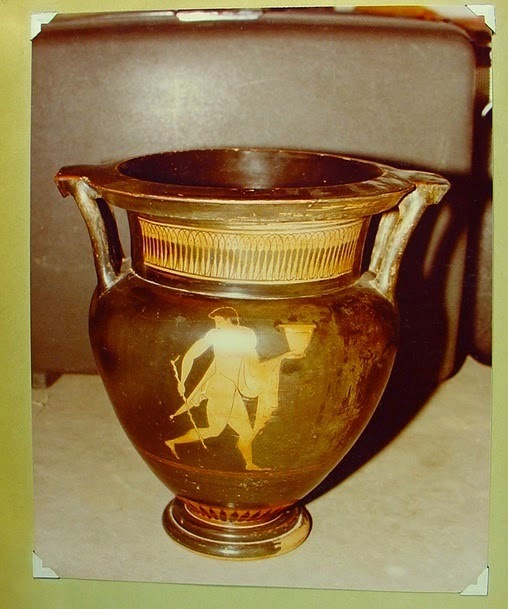 Christie’s had an auction of antiquities on Dec. 11, and some of the objects up for auction were ‘matched’ with photographic archives seized from dealers and collectors who deal in illicit material. These matches have always left me a little uneasy. If an object is matched, it means it is most likely looted. But the auction houses have no good way to match these objects because these photo archives are closely held by law enforcement agencies and a group of researchers. There are claims that the auction houses could go directly to Greek or Italian officials and have these objects checked against these databases for free. As Christos Tsiogiannis answered when asked by Catherine Schofield Sezgin: “The auction houses, and the members of the international antiquities market in general, always have the opportunity to contact the Italian and Greek authorities directly, before the auctions. These authorities will check, for free, every single object for them.” But it seems they do not do this. Objects are invariably withdrawn after a match, where they disappear back into collections in most cases, and we are left with little progress in stemming future looting and protection of sites. And so each new antiquities auction continues the cycle of public shaming and return. But the looting continues. The title of this paper is, of course, a play upon the title of Professor John Henry Merryman’s well-known essay which laid out the ways of conceptualizing cultural property law there are two ways to think about cultural objects. One as part of a national patrimony, and second as a piece of our collective cultural heritage. In a similar way there are two ways to envision jurisdiction of cultural heritage crime. Criminal law can of course apply to policing the individuals responsible for stealing, looting, selling and transporting illicit art and antiquities. Or, law enforcement resources can be used to secure the successful return of stolen art, and the protection of sites. The criminal law can regulate people; and it can also regulate things. In order to produce meaningful change in the disposition of art, it must do both effectively. Focusing on art at the expense of criminal deterrence for individuals is an incomplete strategy. There are no reported details about the theft from the storage facility. 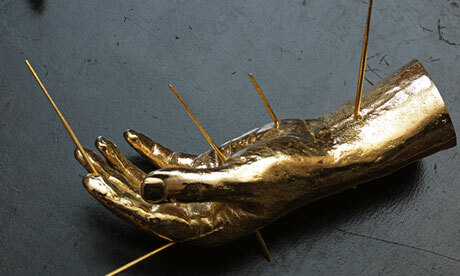 Charlote Higgins, Turner prize-winner’s work stolen from Christie’s, http://www.guardian.co.uk/artanddesign/2012/nov/29/turner-sculpture-stolen-christies (last visited Nov 29, 2012). More Reactions to the "Medici Dossier"
Kimberley Alderman starts a discussion on whether Italy should release all the images in the “Medici Dossier”. Christie’s is being criticized for leaving on the auction block three items which have been alleged by archaeologists and an Italian prosecutor to have originated from the famous and illicit antiquities trader, Giacomo Medici. Italy, however, has not submitted a formal request for repatriation of the objects to the U.S. government or even a title claim to Christie’s. What the Italians are doing is outrageous. They are deliberately withholding the Medici files from the public, allowing hot pieces to remain in circulation and then playing up every seizure for maximum publicity value. They continue to play the role of victim when actually they have became cynical predators on American institutions that want nothing more than to do the right thing. David Gill responds with his typical pointed questions about diligence for buyers, Christies, and collecting histories. I think many good points are made here, and we need to have an open conversation about what role the market and auction houses can or should play in this trade. Damage is done, demand remains high, and the current rules aren’t preventing destruction or producing an honest market. I’ve argued that auction houses need to be held to a higher standerd, because they act as heritage market makers, and the fact that an object comes up for auction means something, and is an important event in the history of an objects such that increased liability should attach when these objects are found to be lost or stolen. David Gill, Christie’s, the Medici Dossier and William G. Pearlstein Looting matters (2010), http://lootingmatters.blogspot.com/2010/06/christies-medici-dossier-and-william-g.html (last visited Jun 7, 2010). Kimberley Alderman, Is Italy “Asking For It” By Refusing to Release the Medici Photographs? Three items at Christie’s raise questions « The Cultural Property and Archaeology Law Blog, http://culturalpropertylaw.wordpress.com/2010/06/06/is-italy-asking-for-it-by-refusing-to-release-the-medici-photographs-three-items-at-christies-raise-questions/ (last visited Jun 7, 2010). Author Derek FinchamPosted on June 7, 2010 Categories AntiquitiesTags Christie's, Giacomo Medici1 Comment on More Reactions to the "Medici Dossier"
1. Sotheby’s and Christie’s are undoubtedly at the top of the heap in the art dealing industry. Based on my circle of acquaintances, which includes many unemployed or underemployed artists, art curators and art experts, it seems likely to me that Sotheby’s and Christie’s benefit from being in a buyer’s market when it comes to hiring executives. If both companies under-compensated their executives, where would those executives go? And if they left, so what? Couldn’t Sotheby’s and Christie’s easily find highly competent replacements who would work on paint fumes just for the honor of getting those great auction houses on their resumes? 2. But even if I’m wrong about that, if Christie’s were really interested in luring executives away from Sotheby’s, couldn’t they just ask the executives about what sort of compensation package it would take to motivate them to move? Is there a number one rule of Sotheby’s Club that you don’t talk about Sotheby’s Club? 3. In any case, didn’t Sotheby’s waive its right to whine about the hassles of disclosure when it went public? Daniel Wakin, Sotheby’s Keeps Its Executive Bonus Plan Under Wraps – ArtsBeat Blog – NYTimes.com. "Christies takes disputed earrings off auction block"
The gold neo-Assyrian earrings were claimed by Iraq but awaiting the highest bidder Monday in New York. Just days before the sale of ancient art and antiquities, however, Christie’s took the jewelry, believed to be from the treasure of Nimrud, off the auction block. Christie’s says it is cooperating with an investigation into whether the earrings were in fact stolen from Iraq. US officials say they have been involved for at least several weeks in trying to prevent the earrings from being sold after they were alerted that the ancient jewelry might have been part of the treasures of Nimrud, one of Iraq’s greatest archaeological finds. “This is an issue we have been aware of for quite some time,” says Adam Ereli, spokesman for the US Embassy in Baghdad. The Christie’s spokeswoman said she did not know why they were publicly withdrawn from sale only Thursday. The treasures of Nimrud are considered one of the most important finds of the last century – the hundreds of pieces of gold jewelry, bowls, and ornaments compare in lavishness to the jewelry from King Tut’s tomb. A prominent Iraqi archaeologist, who photographed the hundreds of pieces excavated from the ancient Assyrian capital in 1989, says the earrings are unique. “I’m sure it is from the collection. I’ve been there during the excavations, I know the pieces,” says Donny George, former director of the Iraq museum and now a professor at Long Island’s Stony Brook University. The interesting issue now is whether there’s going to be enough evidence or a fruitful investigation. Who consigned the earrings to Christie’s? Removing the earrings from auction is great, and Christie’s should be commended, however that is just the first step. Iraq protested the sale earlier, but this earlier CSM article may have helped prod Christie’s along. Are we able to investigate back up the stream of commerce to discover who stole or looted these earrings? There are very strong import restrictions in place to prevent these objects from being imported into the US. The difficulty is the efficacy of those restrictions, given the massive amount of objects which flood America’s ports. Author Derek FinchamPosted on December 5, 2008 Categories AntiquitiesTags Art Theft, Auction, Christie's, IraqLeave a comment on "Christies takes disputed earrings off auction block"
"Iraq bids to stop Christie’s sale of ancient earrings"
It is imperative, given the current state of regulation of the antiquities trade, for nations of origin to document their existing collections. Unfortunately they are not always willing or able to do that. Baghdad – They were earrings that literally could have been worn by a queen. The neo-Assyrian jewelry, 9,000 to 10,000 years old, is Lot 215 in an auction of ancient art and antiquities to be held at Christie’s in New York next week. They are expected to fetch up to $65,000. Iraqi authorities have petitioned to stop the sale. “We’re hoping to get them back,” says one official. The auction listing says the elaborate gold hoops were acquired from their previous owner before 1969. As of Tuesday evening, the auction house said they had not been withdrawn from sale. On Wednesday, they were still listed on Christie’s website, which refers potential buyers to a German archaeological text “for a similar pair from a royal tomb at Nimrud.” A UNESCO convention enacted in 1970 made it more difficult to trade in illegal antiquities. The difficulty here is the amount of evidence Iraqi officials can muster to show the objects were once in an Iraqi state collection. These objects might be 10,000 years old. Where did they come from? Can something like this really be purchased in ‘good faith’? Indications are that the objects came from the excavation of Nimrud by Iraqi archaeologists. Author Derek FinchamPosted on December 4, 2008 Categories AntiquitiesTags Auction, Christie's, IraqLeave a comment on "Iraq bids to stop Christie’s sale of ancient earrings"
Prices for Russian art, books, manuscripts and historical memorabilia have risen rapidly since 2000, and this has been accompanied by an increase in thefts from Russian museums and archives. In August 2006, the Hermitage disclosed that 226 Russian works of art had been stolen by staff over the previous decade. Will any charges ensue? Someone made up a provenance for these objects somewhere between their theft in Moscow and consignment to Christie’s. I’d imagine it wasn’t the final consignor though, these letters probably passed through a few hands first, and were “laundered”. Perhaps not enough to justify their sale, but probably enough to preclude criminal charges or an investigation. Martin Bailey of the Art Newspaper has an excellent story on the apparent export-bungling by Christie’s and UK authorities of this £3m Rubens masterpiece. The Hunt of Meleager and Atalanta was granted a temporary export permit for 5 days to allow it to be displayed in New York. The work sold in London on December 2005 for £3,144,000 to an anonymous New York buyer. It was then re-exported after the sale. Our policy is to adhere strictly to all applicable laws and standard processes for the international transport of works of art. In the exceptional case of The Hunt of Meleager and Atalanta, a human error led to the accidental shipping of the picture to a client without completion of the appropriate export licensing process. Christie’s regrets the error and are co-operating fully on this matter with all relevant authorities to rectify this situation. Some error. One would think a work of this magnitude would be double checked. Christie’s is subject to criminal penalties, and the New York buyer must be upset as well. Incredibly the Export Reviewing Committee flew to New York to examine the work and has deemed it of Waverley quality. A fundraising effort may now begin. This Persepolis relief fragment owned by Denyse Berend will be up for sale at a Christie’s auction on October 25th. Iran temporarily blocked the last auction in an unsuccessful bid to reclaim the fragment. You can read about the case and my reaction to the High court decision by clicking on the label below. All indications are that Iran will not bid on the fragment. I wonder if there was any attempt by Iran to work out a compromise with Mme. Berend? How should it be allocated? One solution would be to award the orange to the sister with the greater ‘rights’ to the orange. That is the strictly adversarial approach that often characterizes the formal resolution of cultural property disputes today. A second solution would be to award half of the orange to each of the sisters, an appealing compromise until it becomes apparent that one sister wants the orange only to eat its pulp whereas the other wants only the orange peel for cooking. Thus, although compromises may often be preferable to either/or solutions, they typically fail to take contending interests, as opposed to stated positions, into account. A third, better informed allocation of the disputed orange would be to encourage the sisters to express their respective interests in the orange and then to work out a mutually productive, more-than-zero-sum solution to a dispute. Professor Nafziger and the International Law Association have proposed a more collaborative process which has a great deal of merit I think. In this case, Mme. Berend wants to sell the tablet without admitting any wrongdoing, and Iran wants the tablet returned, and perhaps a vindication that its cultural heritage has been taken. Surely there is a middle ground here? In any event the auction will be quite interesting, and I wonder if Iran’s legal challenge will have an impact on the purchase price. It could open any cultural institutions to an ethical claim for repatriation or it more likely cemented the purchaser’s title which is now beyond legal challenge. (Hat tip to Chuck Jones for alerting me to the auction).